Tickets sold out to the formal attire masquerade ball fundraiser hosted by Way to Grow, a 27-year-old nonprofit located in North Minneapolis dedicated to early childhood education. Close to 800 people were in attendance at the downtown Minneapolis Depot from 6-10 pm. The theme this year for Way to Grow’s annual Shine Celebration was “The Future has Arrived.” The Friday, October 28 event included a $150 per-plate dinner, entertainment provided by J.D. 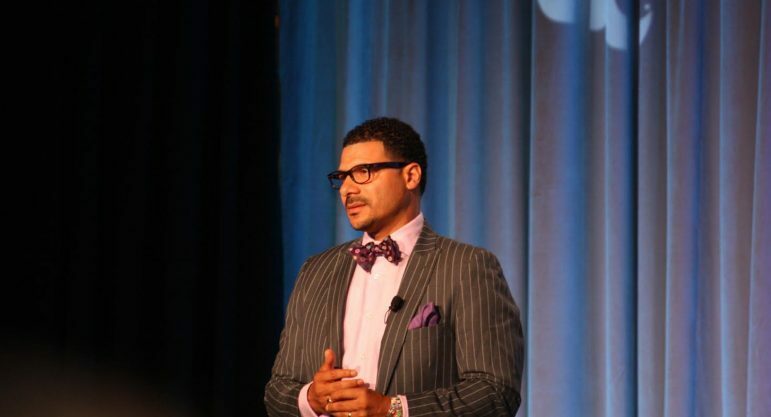 Steele and the MacPhail Community Choir, both live and silent auctions, and as featured keynote speaker Dr. Steve Perry, founder of Capital Preparatory Magnet School in Hartford Connecticut. Dr. Perry advocates for a fair and equal educational system for all children. Capital Preparatory Magnet School is one of the top schools in the country according to sources including U.S. News & World Report, educators throughout the United States, parents of the students of Capital Preparatory Magnet School (that touts a 100 percent graduation rate), and the students from the program that have gone on to four-year colleges. After dinner, Carolyn Smallwood, executive director for Way to Grow, welcomed the audience and introduced the Garcia/Castillo family to the audience by telling a brief story about how she met them. “Our children are not numbers,” said Smallwood, as she stood next to students Shania and Jose Castillo along with their mother Jacqueline Garcia. “Our children and families are defined by their successes… Shania’s mother came to us when she had nowhere else to go. We assigned her to a family agent that connected her to services she needed, provided in-depth home visiting as well, and helped the mother work through the school system, which set the path for Jose and Shania. 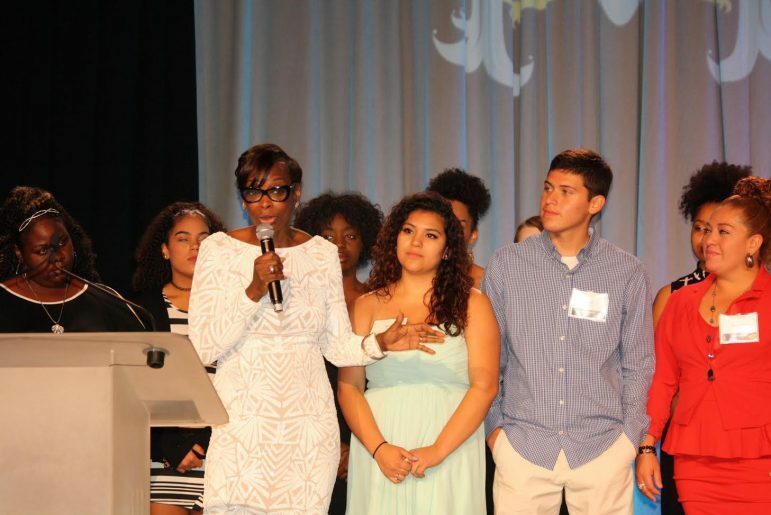 “Today Jose is a straight-A student,” continued Smallwood, “and Shania attends Northwestern University in St. Paul on a full academic scholarship.” Smallwood concluded by saying that this was the second generation of the impact of Way to Grow. According to Smallwood, Way to Grow starts developing kids at an early age all the way to age eight. During the keynote address, Dr. Perry made mention of the Depot and how he was amazed that the building used to be a train station. “How someone transformed this facility to what it is today took vision to see beyond the condition at the time. The same is true for our children. Minnesota has one of the largest achievement gaps in the nation. So let me ask you, what are you scared of? Why not try something new?” Perry suggested. The something new Dr. Perry referred to is Way to Grow. Dr. Perry said it would be fantastic if Way to Grow was the rule instead of being an add-on or exception, explaining the importance of raising funds so that programs like Way to Grow can exist. Apparently his message reached many of the potential donors. In less than 20 minutes after his speech, the goal of $90,000 was surpassed; a total of $100,250 was raised.